We have seen the second sizeable sell-off this year. The SP500 has dropped -7.80% in October (so far), not quite matching the fall of -11.8% in Jan-Feb 2018. The volatility can be an opportunity, and we view it as such. With this in mind, it is worth discussing the technical indicators and then the shift in macro conditions between now and earlier in 2018. We work with London based Longview Economics to position our model portfolios (M-AP). 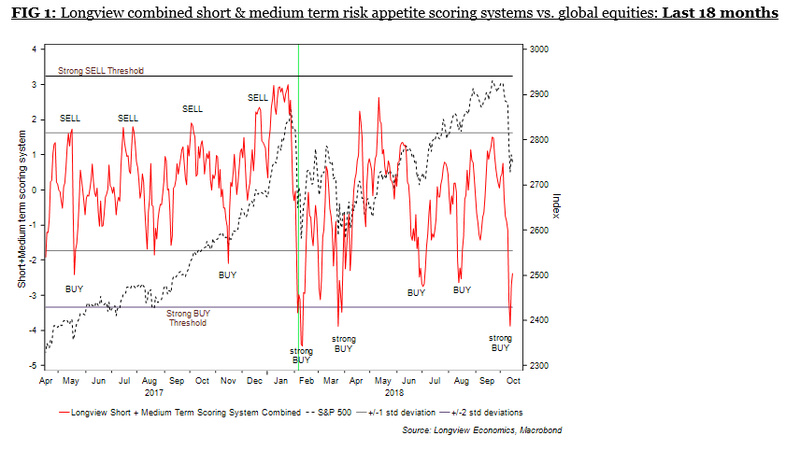 Recently in September, we moved back to a neutral position, by selling equities (M-AP Sep Update). We did a similar adjustment in early 2018. On the 17th January 2018, we moved portfolios back to Neutral, after being overweight equities for some time. At the time markets were “Euphoric”, and the models were presenting numerous sell to strong sell signals which are rare (Longview Alert No. 44, 17th January 2018. Pause/Giveback in Equity Market Uptrend Expected - Remove OW positions in Tactical Portfolios). Then 9 trading days later, the equity correction began. In bull markets, we often see classic “three wave” sell-off. In that pattern, there’s an initial ‘wave one’ of selling, followed by a ‘wave two’ relief rally, and then a ‘third wave’ (of selling) to test wave one intraday lows or make new lows. (see chart below showing the S&P500 over the past 2 years). In March/April 2018, we added risk back to model portfolios (increased equities). The models then showed a clear 3 wave pattern completed (Fig 2.a). Also, monetary conditions, US/Global liquidity remained relatively loose. And Macro data remained relatively supportive. In essence, the bull market remained intact. The question now is, are we seeing another typical “3 Wave” sell-off within a bull market for equities? Currently, we think so and we are likely witnessing the completion of the first wave. The buy signals from the models we are seeing occurred during major pullbacks, including post the BREXIT SELL-off and near local lows during the late 2015/early 2016 wave of risk aversion (Chart below). From a trading perspective, the case to buy equities has increased, however, the likelihood of increased volatility remains high (so traders beware). From a portfolio positioning perspective, it is likely we wait to see confirmation of two things. 1. The strength of the wave 2 recovery. If weak, this gives some clue as to wave 3, which could breach the lows of wave 1. 2. The conclusion of Wave 3. 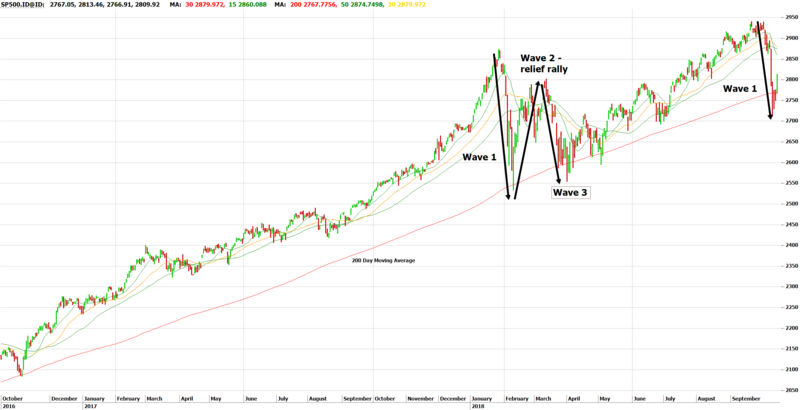 We can contend that we are seeing another 3 wave sell-off, and we may see a buying opportunity in weeks/months. However, we cannot ignore the changes in the Macro situation between now and early 2018. It’s not the same! 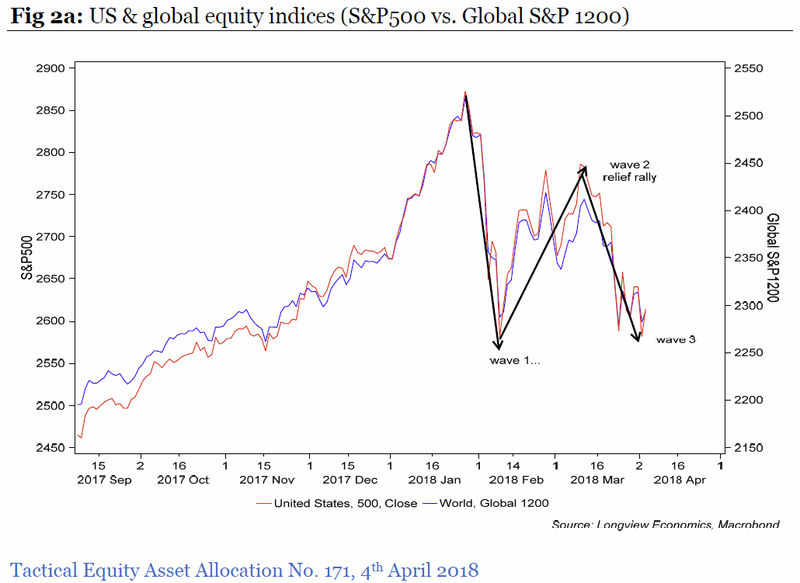 Whilst the US has lead markets higher over 2018, there are noticeable differences in the conditions that have been driving equities. The EU manufacturing PMI has trended lower since the start of 2018. German new orders have shown a sharp deterioration. Are we seeing the early stages of US growth softening? We are seeing early indications of softness in various housing indicators, as well as some slowing in the US banks commercial balance sheets. In response, both China and the EU have continued to indicate they will act in the face of weakness. The Chinese most recently lowering the banks required reserve ratio. And Trumps trade disputes to one side, he is quite prepared to overheat the US economy with Fiscal stimulus, despite the efforts of the FED. So combined stimulus in the face of weakness is still a real option. Past performance does not guarantee future performance. This communication has been issued by Wentworth Global Securities Pty Ltd ("WGS") (ABN: 96 155 409 653) (AFSL: 422 477). WGS is a wholly owned by Wentworth Global Capital Partners Pty Ltd ACN 155 398 333(“WGCP”). Not research: This communication has been prepared by the at Sales and Trading team within the "Securities Division" of Wentworth Global Capital Partners (WGCP). It is not a research report and is not intended as such. This publication is intended solely for information purposes of WGCP's Wholesale, Sophisticated and Professional Investors as defined by the Corporations Act 2001 (Cth) or the equivalent in each respective Jurisdiction. Because this document has been prepared without consideration of any specific clients investment objectives, financial situation or needs, your financial advisor should be consulted before any investment decision is made. WGS does not accept any responsibility to inform you of any matter that subsequently comes to its notice, which may affect any of the information contained in this document. This communication is not intended for US recipients and you should not forward this material into the United States or to any U.S. Persons. If you are a U.S. Person you are required to notify us immediately. Although we believe that the information which this document contains is accurate and reliable as at the date of publishing, WGS have not independently verified information contained in this document which is derived from publicly available sources.